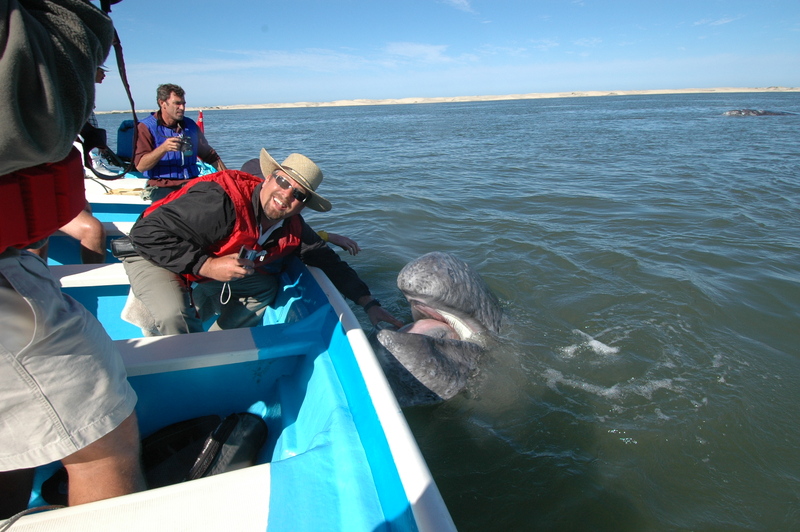 A few years back I flew from Puerto Vallarta to Magdalenay Bay in a small private plane with a group of friends to see the gray whales at “Mag Bay”, as it is sometimes referred to as. It was not a long flight, a couple of hours, landing close to where we could rent a panga and driver and within a few minutes we were out in the bay with mother whales and their babies. The calves behaved like puppies. They would come up along side the boat, roll over and look at you, then it would roll over on its back so you could rub its belly, just like a dog would do. As you rubbed harder the whale would start to pant, opening its mouth, and it also enjoyed having the inside of its mouth massaged as well. It’s not as easy to pat a whale as it is a dog, and both get a little tiring after awhile. But when you neglected to rub as hard as the calf would like, or stopped, it would roll back over on its stomach and swim over to another boat looking for someone else to rub its belly. All during this time the mother whale circled our boat, keeping an eye on all the activity. Quite something! We enjoyed the whales for an hour or so, and a few hours later we were back in Vallarta. In June, 2008 we left port in Dubrovnik, Croatia on a friend’s 54′ Jeaunneau sailboat for the Italian coast on the other side of the Adriatic Sea, down into the Ionian Sea and around the “Boot” of Italy. Our final destination would be Corsica while the boat would continue on to Barcelona. We sailed overnight, stopping briefly in a small port along the way at the bottom of the boot, but then continued on to our real first port of stay, in Messina on the island of Sicily. We spent a few days here, with a one-day car rental trip down the coast to Taormina, a beautiful hillside town about 50 km. down the coast from Messina. Quite a road getting up to Taormina, with its very windy road zig-zagging back and forth up the hill amongst lemon groves, battling with taxis and buses all the way as to who was going to get to go around the corner first. After Messina we sailed out of the Straits of Messina northwards to the town of Tropea. A very picturesque town, nestled right next to the shore on its craggy cliffs, cliffs that actually turn into the walls of homes as the rise upwards. There was a nice port at the base of Tropea and we very much enjoyed walking up the winding stairs into the town to walk its narrow streets. The specialty here is there purple onions, which are fantastic. We ate well in Tropea. After a few days there we were once again on the water heading north, this time to the Amalfi Coast. Amalfi is another cliffside town, as are nearly all the towns on this coastline. This is the type of coastline you see in Italian movies, with the highway winding along a coast which hardly leaves room for a highway, let alone towns. We docked in Amalfi and spent a few days exploring the town and area. We drove up to Ravello, a beautiful town built up high in the hills above the Amalfi Coast, lined with luxurious hotels and sporting panoramic views of the coastline. We do want to return to this area, and include Positano in our tour. Would love to do this one by motorcycle or a small convertible, as there just so much to see while driving the coast. When leaving Amalfi we made a stop in Capri. Although it looks impressive from the sea upon arrival, we found it just way to built up for tourism. Many cruise ships dock here so the streets are loaded with people and its turned into more of an outdoor shopping center with so many name-brand shops and tourist-type restaurants (meaning poor food and service). We had a lousy lunch and we are ready to get out of there. 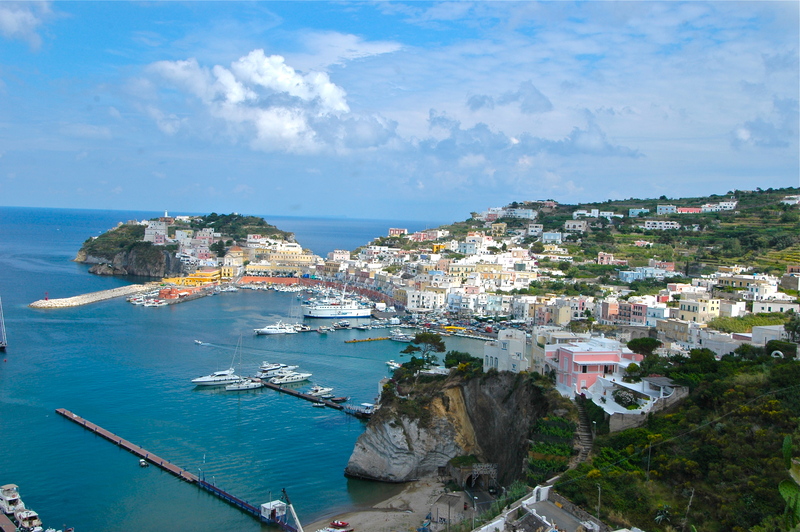 Next stop was the island of Ponza. We stayed a few days here, enjoying the escape from the crowds of Capri and Amalfi and relatively slow pace of island life. We very much enjoyed renting scooters and touring the island. Our next stop was another island, Elba, which offered much of the same as Ponza, and was another place we very much enjoyed touring on scooters, with much more to see on Elba because of its size. After Elba we headed over to Corsica, landing in Bastia. Beautiful port in Bastia and excellent food and wine. This is where we parted with our friends, they leaving for Barcelona and us taking the train over Corsica to Ajaccio. This train ride is quite something, climbing up into the mountains with still snow-capped peaks before back down to the shore to Ajaccio. From here we caught a plane over to Nice for a few days. Quite a trip; we covered a lot of sea miles over about a three-week period. Great trip with lots of great memories.